1. What is animal rights extremism? 2. How can we tackle animal rights extremism? 3. What should you do if you have been targeted? 4. What you can do to protect yourself? Animal Rights Extremism is acts of, or threats of, violence against property or persons used to coerce institutions or individuals into ending animal research. This includes, but is not limited to, physical violence, death threats directed at individuals and their family, arson, incendiary devices (real or hoax), vandalizing individuals homes and vehicles, and a plethora of other methods (including two separate cases of grave robbing). AR extremism is carried out by a small minority of animal rights activists who believe that they are justified in going above and beyond the law for the sake of the animals (see AR beliefs). It is worth being clear that most activists do not commit or condone these activities, and we encourage all individuals from both sides of the debate to clearly and openly condemn them. Furthermore, by refusing the condemn violent actions, some AR groups (e.g. PETA founder, Ingrid Newkirk, “I will be the last person to condemn the ALF“) have effectively given their tacit approval to extremists’ tactics. 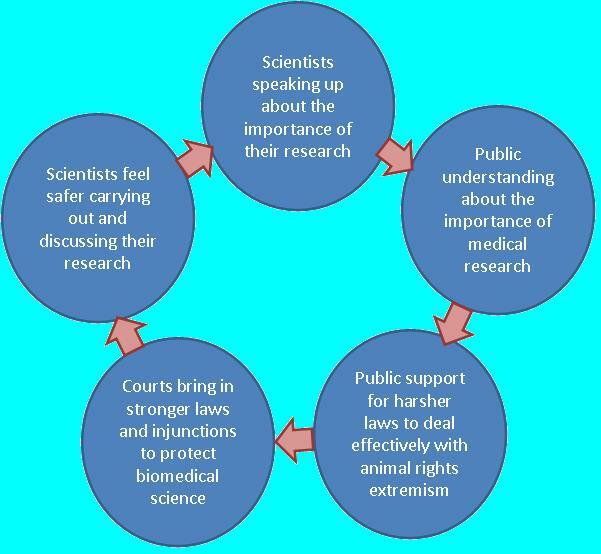 AR extremism has the effect of overshadowing the important debate on the need for animals in research, scaring many scientists into silence; this means that the debate becomes one-sided, monopolized by animal rights activists. It is at this point that public opinion can turn against medical research, and activists can make headway into pushing governments and research institutions into scaling back (or banning) animal research to a point where medical developments of the future are severely challenged. How can we tackle animal rights extremism? If we look at the diagram below we see how animal rights extremism can, and must, be tackled from many angles. Speaking of Research aims to help this process by encouraging scientists to speak up about their work and try to inform public opinion by providing them with the straight facts about research. Some organizations and institutions have encouraged researchers to keep a low profile and downplay any links they may have with animal research. These same organizations tend to also highlight the role of police forces and governments in tackling extremism. While SR agrees that police and government have a vital role to play, we also believe that bringing the public onside to the cause gives both the scientists the encouragement to talk about their work – reinforcing the importance of biomedical research into the public conciousness, and can give the governments a mandate to deal with extremism quickly. Furthermore, public support for research can help dissuade many would-be AR activists and extremists away from the unpopular AR cause. We believe it is crucial that scientists, regardless of whether they are an AR target, speak up positively about their research and the research of others. 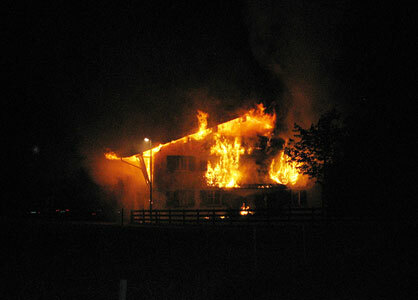 AR Extremist groups like the Animal Liberation Front (ALF) and the Animal Rights Militia (ARM) want people to spread the fear created by their more extreme actions (grave robbery, arson and flooding attacks on homes, suspect packages through the mail). However, by doing so we inadvertently scare other scientists away from talking publicly about their work. This climate of fear works in the favor of extremists who rely on scare-tactics to further their goals of cutting down animal research by making scientists believe there is a high risk attached to carrying it out. The truth is that relatively few scientists are ever targeted by extremists, and trying to keep one’s head down when this happens is rarely a successful solution – it can often lead to extremists simply pushing harder. See below for practical steps to take if you are targeted. It is important to be aware that there is a community of scientists and organizations prepared to support you and help you to mobilize the resources you need to confront the harassment and mitigate its effect on your research and your home life. The first step is to let people know of your situation. If people don’t know, they won’t be able to help. Contact your university administration, officers in the leading scientific organizations to which you belong, and other individuals that have been affected; many members of the SR Committee – as well as many other scientists around the world – have been targeted, and are usually willing to assist anyone needing advice or support. Consult with you officers at your funding agencies so that they are aware of the situation and are aware that your research is being targeted. Most importantly, empower yourself and share your experience with others. Talk to your colleagues and students about the events and the impact they have had on you. Get your campus community involved in a vocal condemnation of the harassment. Consider writing a letter to the editor of your local or university paper describing the harassment and how it aims to prevent you continuing the critical research that your laboratory is conducting. Also, think about becoming an advocate for humane, regulated biomedical research, and reach out to organizations that support research as potential partners in your effort, as well as to the media. Collectively, it is important that scientists speak out about why animal research is, and continues to be, a vital tool in development of lifesaving medical treatments. Rather than allowing those who are under duress to feel abandoned and alone, it is critical that researchers – including those being targeted – can join together to combat the initimidation. After first seeing the harassment of my colleagues and then watching my own car burn to the ground, I decided to speak out against the extremists and in support of research. I believe that this has ultimately helped those affected, including myself, to feel safer. Perhaps most critically, I think that we are helping to protect those who may be next in the extremists sights. Make sure your neighbors are aware of your work and understand it’s benefits. Neighbors are frequently some of a researcher’s best advocates and they will also be on the lookout for unusual behavior when you are away. Ensure you have adequate home security. Decent outdoor lighting is an easy way of deterring activists. Consult your employer and local police force for advice; this will also put you on their radar. The police can flag your address as a priority in case of any home harassment. Contact the telephone company to have yourself removed from the directory. Check your online presence and ensure personal information is not readily available to anyone looking. Make a note of the business phone number of your local police department (and the university police department, if applicable). Contact the office responsible for media/press relations at your institution or employer. Activists want publicity. Your press officer can help you deal with media attention that comes with a protest. If you have any concerns, please contact us and we will do our best to help you or put you in touch with those that can.